The Heuglin's Masked Weaver Ploceus heuglini is found in the woodland savanna belt from West to East Africa. The breeding male has a pale eye, and a black mask that extends to a narrow point on its breast. The crown is golden yellow with no black on the forehead, and the back is plain green. It does not overlap with the similar but larger Speke's Weaver. The Lesser Masked Weaver also has a pale eye but the head is black from the forehead to the mid-crown. 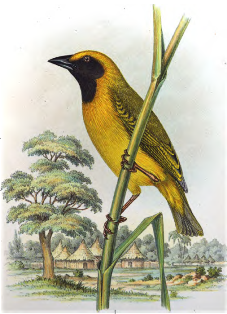 The Vitelline Masked Weaver has a red eye in both sexes, a chestnut wash on the crown (male), and less yellow underparts (female and non-breeding male). The female Heuglin's Masked Weaver is very similar to the female Lesser Masked but has pink, not grey, legs. The Heuglin's Masked Weaver is found in southern Senegal and Gambia, across West Africa to extreme western Kenya (see map below based on Birds of Africa). No subspecies are recognised. Heuglin's Masked Weaver inhabits savanna woodland, coastal thickets, secondary scrubland and is found around farms and villages. It generally prefers dry, tall woodland areas. It moves away from its breeding areas after nesting and movements may be related to regional rainfall patterns. It feeds mainly on arthropods, including spiders, caterpillars, beetles, dragonflies, grasshoppers. It also feeds on fruits and grass seeds. In Ivory Coast, its diet was estimated as 70% arthropods, 10% fruit and 20% seeds by weight. It examines leaves and flowers, apparently searching for insects. The Heuglin's Masked Weaver is polygynous. It is a colonial or solitary nester, typically having up to 15 nests in a colony. The same sites are used annually, and sites are usually away from water. It may form mixed colonies with other weaver species. The nest is kidney-shaped, with a tunnel up to 20 cm long extending from the entrance. The nest is placed in a tree, or often attached to telephone lines with each nest woven to the wire throughout its width for additional stability. The nest is coarsely woven by the male using strips of grass or grass stems, and may be completed in a day. The male displays by quivering his wings and tail, or beating his wings, while hanging below a nest. If a female accepts a nest, she lines it with downy flowerheads of grasses. The male does not strip leaves from the vegetation around the nest. Heuglin's Masked Weavers often choose protected nest sites. One colony overhung the entrance of a busy rest house in Nigeria. Nests may be attached to the base of the nests of an Augur Buzzard Buteo auguralis, Crowned Hawk-eagle Stephanoaetus coronatus, African White-backed Vulture Gyps africanus, Marabou Leptoptilus crumeniferus or Abdim's Stork Ciconia abdimii. Alternatively, nests are often associated with stinging or biting insects like mud wasps Megachile, paper wasps Polistes fastidiosus and Ropalidia cincta, bees Apis, and the red weaver ant Oecophylla smaragdina. The clutch is 2-4 eggs, and the eggs are plain turquoise-blue, or pale blue with very fine brown spots. The female incubates the eggs and feeds the chicks. Some nests are parasitized by the Diederik Cuckoo Chrysococcyx caprius in Mali. The Heuglin's Masked Weaver has one PHOWN record from Gambia (see PHOWN summary) and many more are needed. Old nests may be taken over by the Cut-throat Finch Amadina fasciata, African Silverbill Euodice cantans, or Red-cheeked Cordon-bleu Uraeginthus bengalus, and these records can be submitted too! Submit any weaver nest records to PHOWN (PHOtos of Weaver Nests) via the Virtual Museum upload site.